Is Your Product Like A Well-Run Restaurant, Or A Dirty Dive? You can use the restaurant metaphor endlessly when talking about products. A well-run restaurant has many of the qualities that we want in an elegant, productive application. The front of the house is clean, it’s satisfying, what you get is closely related to what it says on the menu, it conforms to reasonable expectations and conventions, such as appetizers come first, then entrees, then desserts. And a good waiter is a wonderful analog for the user’s experience. In a good restaurant the back of the house is a well-running machine that you don’t have to know much, about staffed by people who are experts at doing what you want, in hygienic conditions and with hygienic practices, where the food is fresh and anything that jeopardizes those things is dealt with immediately. But the user experience of a lot of products is more like a restaurant where the menu is not organized into appetizers, entrees, and desserts, and where if you ask the waiter “what’s good,” he says “didn’t you read the descriptions? How do I know what you’d like?” and who then gives you a separate menu that has meaningless descriptions of each dish that only says what the ingredient list is (but not all of it), and doesn’t say anything about how the food is prepared. In fact, it can be a lot worse than this. 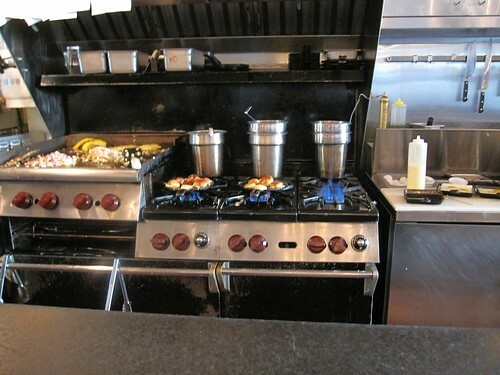 There are plenty of products out there that are like a restaurant whose walk-in fridge is broken, the food is spoiling, and only two of the burners on the big stove are working. Not only does the food (desired results) come out slowly, but it might be spoiled. This is especially bad if all the owner wants is new dishes on the menu, plus a better font. If your restaurant was in that kind of shape, you’d go out of business fast unless you moved quickly to get those behind-the-scenes problems fixed. And no menu change would help, especially not a font change. What kind of “restaurant” are you running? Is the kitchen in good shape? Are you putting out fresh, unspoiled dishes? Can the cooks keep up with demand (no broken stoves)? Does the food that’s coming out of the kitchen line up with what it says on the menu?